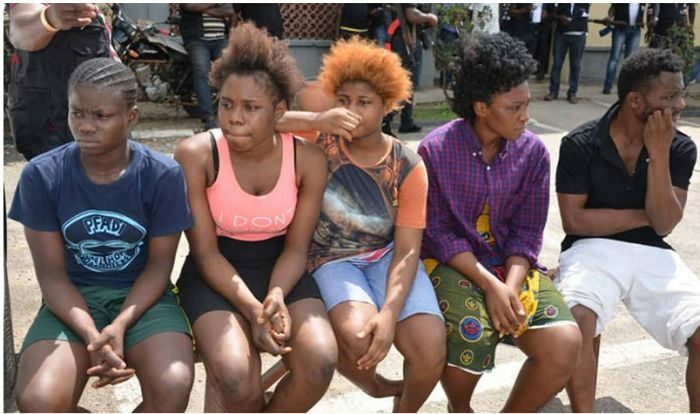 Three girls who were trafficked from the Southsouth and Southeast to Lagos for prostitution yesterday said they were forced to sleep with seven to 10 men everyday to meet their N30,000 daily target. The victims – Helen Dickson, 22; Deborah David, 18 and Chinwendu Oyekachi, 18 – were allegedly lured to Lagos by a man identified as Ikechukwu Egbulefu, with promises of decent jobs. But on arriving the Centre of Excellence, the victims said Egbulefu’s lover, Vera John, told them the job they had for them was prostitution, adding that anyone who refused would be abandoned on the street. Luck ran out on the suspected traffickers when the police got information that the victims were being held hostage at Wagbas Hotel in Ajah, where they were reportedly forced into prostitution. At the police command headquarters in Ikeja, the state capital, yesterday, the victims said aside being made to sleep with many men each day, Vera, who they called mummy, usually took all the money from them. Chinwendu, who wept uncontrollably, said she had been in the hotel since April, adding that the suspects even took her to a witch doctor after she was accused of stealing some money. She said: “She (Vera) threatened us. Two of us they brought to Lagos. The other girl ran away and she (Vera) went to the native doctor to make her run mad. She used to beat us that we were not making enough money like the others girls. “That was how she took us to the native doctor. The man took some hair from my private part and my head. She made me swear to an oath that I would die if I ever stole from her. She would make us sleep with so many men and yet leave us penniless. “I do not even know where the other girl is. I do not know if she ran mad. She’s from my village. I have not seen her since that time Mummy Vera told the native doctor to make her go mad. Chinwendu said her parents were not aware she was into prostitution. She said: “They did not allow me to tell my parents. I did not even know I was coming to Lagos that day. I want to Ikechukwu’s house with my brother and it was late. So, I slept over there. The following morning, he said we should go to the automated teller machine (ATM). That is the last thing I remember, and that was how I got to Lagos and started prostitution. Deborah said she was brought to Lagos last month after a promise that she would get a cleaning job at a hotel. She said: “I was never told it was prostitution. Ikechukwu told me that he would get a cleaner’s job for me at a hotel. I have never been to Lagos and I do not know anyone here. “When we got to Lagos, he took me to Wagbas Hotel and that was where Mummy Vera told me that it is prostitution. I told her I did not want to do it but she said she would give me N2,000 to go back to Port Harcourt, te Rivers State capital, where they brought me from. “She knew the money cannot take me back and she said I would just be on the street and a ritualist would kill me. I did not have anywhere to stay. It was not easy. “There was another girl they brought. When they told us it was prostitution, she refused and called her sister, who lives in Lagos. Mummy Vera dropped her on the road. The girl promised to return with her sister to get me out but I did not see her. “On week days, I sleep with four to six men daily and during weekends, it is between seven and 10. Yes, the men use protection. They pay between N3,000 and N5,000 each. Mummy Vera said we have to be making N30,000 daily and when we do not, she beats us. “The men pay us and she collects the money immediately they leave. She does not give us money. She only gives us food. Some men even sleep with us when we are menstruating. Vera said the girls knew they were coming to the state for prostitution. She denied allegations of assaults and harassment. The suspect also denied exploiting the girls, insisting that she kept their money for proper management and to send stipends to their parents back home. Davido ready to sell out O2 Arena Soon! Kizz Daniel Unfollows Chidinma On IG!